‘Detectives de Aves’ at the Linda Vista School. Photo by Jean Schroeder. Getting local students interested in birds and their habitats is a full time job! 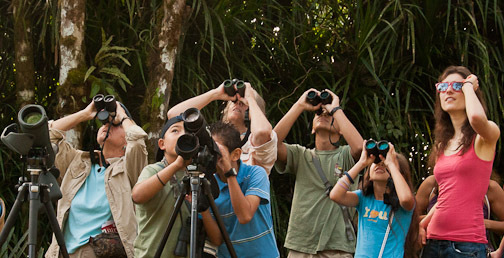 Cornell University Laboratory of Ornithology Department of Education has created a Citizen Science environmental education curriculum called “BirdSleuth-International”. The Club has introduced this curriculum in local schools under the name “Detectives de Aves”. If you would like to help by supplying sorely-needed materials (especially binoculars), assisting in class, running the final class field trip or contributing to teachers’ salaries, please contact us. 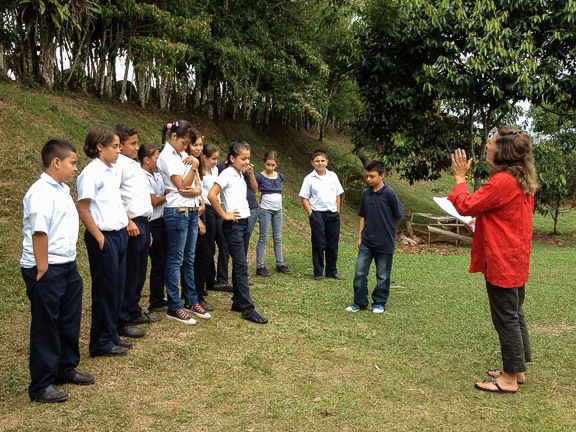 In May 2012, the Club organized a teacher training workshop the Detectives de Aves program at the OTS/Las Cruces Biological Station (see report here). Since 2013, more than 500 elementary school students have participated in this wonderful program. For more information about this exciting program, please visit our Education page. We are always looking for ways to acquire more binoculars and field guides to lend to bird walk participants who often lack both of these critical items but especially binoculars, without which a meaningful birding experience is well-nigh impossible. Through personal donations and small grant writing efforts, we hope to obtain the necessary funds to buy several more pairs of but good quality binoculars suitable for birding. We have a special arrangement with The Audubon Shop, one of our partners, that can get us a very serviceable pair of binoculars for about $80, their cost. If you would like to make a donation to this project or can lead us to an organization that might help, please contact us. Even used binoculars, in good condition, will be happily accepted.